Service- Durgamba non a/c Sleeper. After spending a scintillating day in Mangalore hunting buses and doing some nature photography, it was time to say good bye to Mangalore. After having a heavy meal, thanks to Mr Yeshwanth Kadri and his family I was all set to return back to Bangalore in a Durgamba Travels bus. 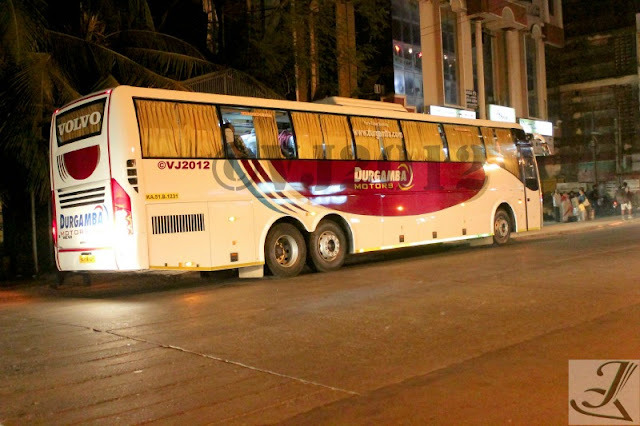 For people who are not aware of this service, Durgamba Travels is one of the oldest and amongst the best service in Mangalore operating since 1975.They are considered as the ‘master’ on Bangalore-Mangalore sector. Known for their quick, customer friendly and safe service getting a ticket even on a weekday is a daunting task as their buses always run full. After my fiasco during my journey from Bangalore-Kundapur, I decided to book my return tickets and requested Mr Yeshwanth Kadri if he could get a ticket on this service. He got a ticket on a bus which had a drop service in Vijayanagar. The departure time of my bus was at 10:40pm from Durgamba Travels head office at PVS. Mr Kadri who is a frequent traveler on this service dropped me at the bus stop at 10pm, got my tickets checked in and was all set to set foot on this service after more than a decade. I was a frequent traveler on this service and used this service when I visited Mangalore during my college days but after KSRTC rapidly expanded their service to Mangalore and the unavailability of tickets on Durgamba travels ensured that I had to wait all these years before trying their service again. I decided to do some Bus fanning (as always) as this place is a gold mine for bus fans filled with buses on either side of the roads. The entire stretch was lined up with Durgamba buses and went ahead clicking pictures. During this time most of KSRTC services bound to Bangalore passed by this lane. 10:20pm- The new Durgamba B9R bound to Bangalore (BIAL) from Kundapur arrived, since the lane was already crowded, I crossed over to the other side of the road to take pictures of this new bus. 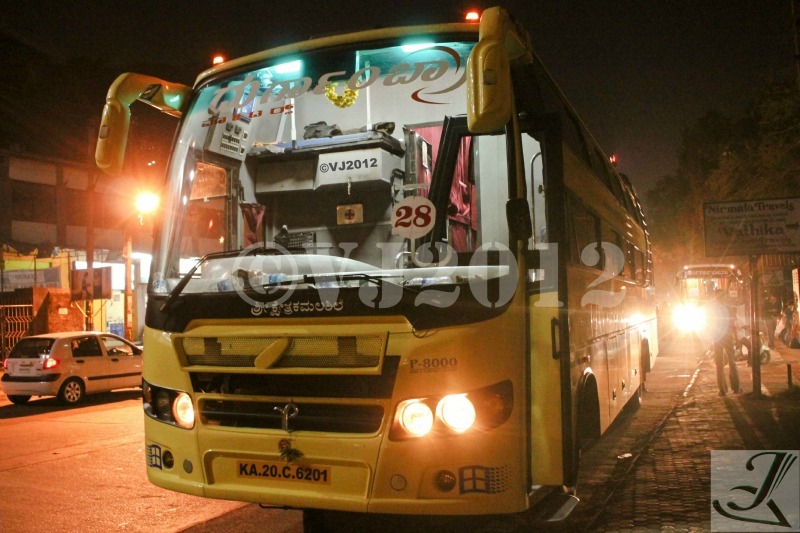 Just as I was taking the pictures, my bus to Bangalore, route number 28 arrived. The bus which was supposed to arrive at 10:40pm was early by 20minutes. I took a couple of pictures of my bus and crossed the bus road again to take a couple more pictures of the B9R before boarding my bus as I was under a perception that though my bus was early, it would only depart around 10:40pm. I went on clicking the pictures of the B9R while the passengers started boarding my bus and no sooner the passengers boarded, the cleaner closed the door and the driver started to move the bus..!!! I immediately crossed the road and stopped my bus and boarded the same. It was a brand new bus (Ashley) built my Prakash body builders and the interiors of the bus were very pleasing. The cleaner checked my tickets and I made my way towards my berth. The gangway was spacious and not cramped. Climbed into my berth and started to settle down. Though mine was a single berth, the space was humongous. As I was settling down, the bus slowly made its way out towards Padil circle. It picked up few more passengers here and then the action started. The bus just ‘flew’ on the highway. The bus overtook every vehicle which was infront of us which included an Airavat bound to Bangalore. 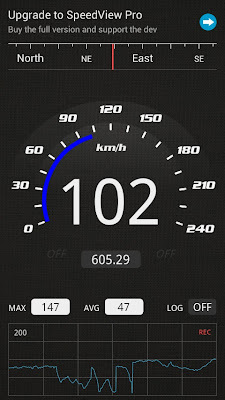 As I saw this action unfold infront of my eyes, I immediately grabbed by cellphone and switched on the GPS speed tracker and it showed our speed close to 105kmph..!!! Though I was seated at the back, the suspension was just too good for an Ashley. We reached Farangipete and stopped for a couple of minutes. Again we resumed our journey and as usual the speed the bus was doing was phenomenal. The scheduled time of arrival on this bus at Vijayanagar is at 6am; hence I called up my friend and asked him to pick me up. I finally sunk into deep sleep while the bus just kept on doing great speeds. The bus finally reached the foot of Shiradi ghat and went ahead climbing the same. The bus was so powerful that it overtook an SRS bus which was struggling to make its way around a hair-pin bend in the ghat. While our bus overtook the SRS bus, I could hear the engine noise of both my bus and that of the SRS. I remember Mr Kadri telling me that the new Durgamba buses come fitted with a 245bhp CRDi Ashley engines. I am not sure if this bus was fitted with the same but the way it went about flying on the roads and climbing the ghat, it gave me no choice but to believe the same. As the bus made its way through the ghat roads, I slipped back into sleep. When I woke up around 2:00am, the bus had stopped for a break. However I decided to continue my sleep. 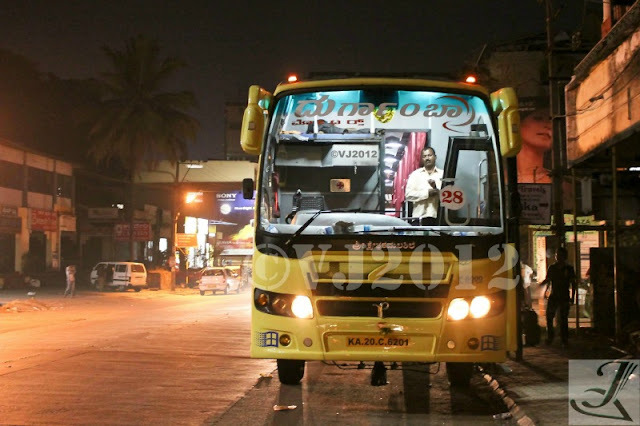 The bus again resumed its journey and at around 5:15am the lights in the bus came on and the cleaner came in shouting ‘Gorguntepalya’ (in a typical Mangalorean accent :)) I woke up with half of my eyes still closed while the empty roads of Bangalore welcomed me. The bus slowly made its way towards Navrang, dropped passengers and headed towards Swati restaurant. There were few passengers who wanted to go towards KBS and beyond, the cleaner asked the passengers to board a Jayanagar bound Durgamba bus which was parked infront of us. He advised the passengers to co-ordinate with the cleaner of that bus with regards to their respective drop point along the way. 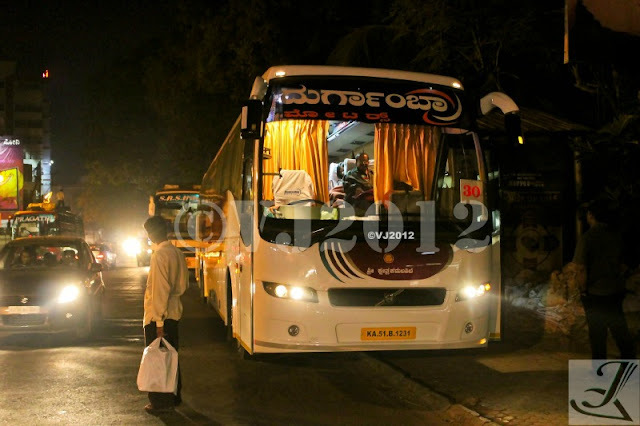 The bus made its way towards Vijayanagar and I was dropped off at Vijayanagar bus stand at 5:35am. Will I take this service again…?? Of course I will. Though the bus reached almost 25mins before its scheduled time in Bangalore, the bus all along the way was driven exceptionally well. No rash driving, no harsh breaking, no risking overtaking maneuvers or swaying the bus around. 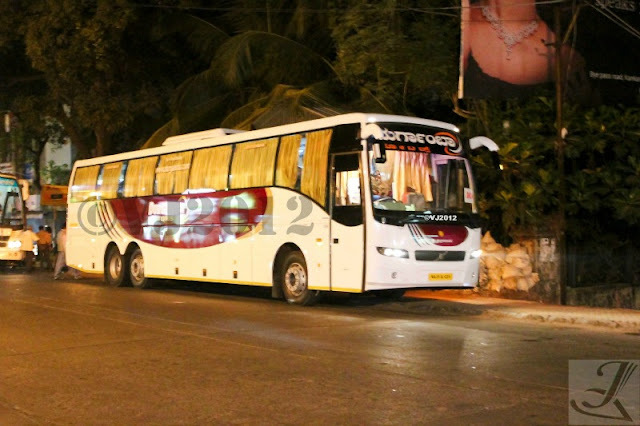 This service is ideal for office goers who usually travel to Mangalore and beyond on weekends and return back to Bangalore on Monday mornings.